SERVED: On Saturday night, it was a big night for Apollo Ohno. He was one medal away from tieing the record for most medals at the Winter Olympics. He easily won his first qualifier and was very close in the second, but it seemed like a forgone conclusion that Apollo would medal in the 1500. In the finals, at the 2nd to last lap, all 3 Koreans suddenly passed Apollo and it looked like a sweep by Korea and an Apollo-loss, until 2 Koreans took each other out, allowing Apollo and fellow American Short Tracker JR Celski skated into silver and bronze. SERVED! At any other qualifier, they would've moved on, but in the finals? Tough luck. 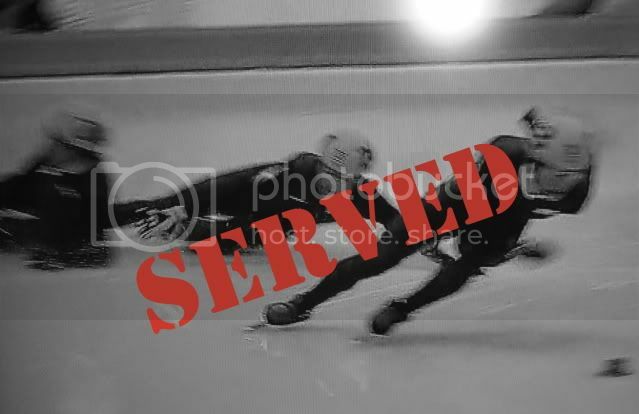 These two speedskaters totally got SERVED!